With the changing times, the story 'Lesson in Thrift' has become very apt to the present society. This story from Mahabharata surpasses the limits of space and time. During the ancient times, the Pandavas attained power after defeating the Kauravas in a battle. Yudhishthira was the eldest Pandava and was accordingly crowned the King. The ceremonies and customs of the coronation were completed soon and it was time to get back to the administrative work of the subjects. The new king was soon engaged in his duties. However, the intelligent and trusted younger brothers constantly assisted Yudhishthira. He was busy setting the affairs of the kingdom in proper order. Since he was supervising a very large kingdom, this task got difficult day by day. Yudhishthira was thoughtful and worried about certain parts of his kingdom that had been affected by drought just before the war had begun. The Kauravas were probably busy plotting against their cousins and preparing for war and thus did not pay proper attention to the situation. They also neglected taking any remedial measures that were necessary at that time. Eventually, the drought resulted in a disastrous famine in some remote parts of the kingdom. The situation was grave, as thousands of people died of starvation and the death toll kept rising with every passing day. The king planned to help his subjects to recover at least part of their wealth and soon sent relief supplies to the province. Unfortunately, there was no surplus food anywhere else in the kingdom. The drought did not spare the crops too. Yudhishthira was in a dilemma and did not know what to do to save his kingdom. He met a hermit and requested him for advice on how to overcome the situation. After thinking over the problem, the sage replied that there was only one way to solve the problem right away. He said that Kubera or the Lord of Wealth had a secret granary hidden deep into the Himalayas. He asked the king to approach Lord Kubera and explain to him the grave situation. The Lord would definitely spare some food-grain for the needy subjects once he was convinced of the disaster. The sage told King Yudhishthira the exact location of the secret granary. On hearing the advice a new hope was born in Yudhishthira's heart. He immediately called his brother Bhima and told him what the sage had said. He appealed to Bhima to leave for the secret granary immediately and meet Kubera. However Bhima was neither convinced nor optimistic about this idea of meeting Kubera. He believed that Kubera was an accumulator and like all hoarders, he expected him also to be miserly. Moreover if Kubera had kept his granary hidden, it surely proved that he would not like to share his bounty with others. Still Bhima did not argue with his brother; rather he obeyed his elder brother's order and quietly set off on his mission. The journey up the Himalayas was stressful and tiring, but Bhima finally located the secret granary. Bhima was just about to enter the granary, when he observed from behind the door an unexpected scene unfolding inside. Lord Kubera was sitting amidst countless sacks of grain-sacks and was monitoring the storage of the stocks. One of the servants pointing to a sack, informed Kubera that there was hardly any grain inside the sack and it was all sand within, and it can be discarded. Lord Kubera asked the servant to bring the sack to him and said he would show where exactly the grain was. Kubera took the sack, emptied it out on the floor, and sat down to sift out grains from the sand. The task was laborious, but slowly, a large pile of grains emerged. Bhima felt utterly disgusted watching this scene. He thought to himself, “This man who owns more wealth than anyone else in all the three worlds is struggling to save a bagful of grains!” Bhima was assured of Kubera's greed and felt that his brother was wrong to have sent him there expecting a donation from the miser Kubera. He turned back to leave the place, when suddenly Lord Kubera called him in. Lord Kubera rushed towards the door to welcome Bhima and took him in. With no choice, Bhima followed him inside. Kubera offered him a comfortable seat within the granary itself. Kubera ordered his servants to bring refreshments for the eminent guest. The warm welcome gladdened Bhima. Yet he hesitated to tell Kubera the purpose of his visit. He felt sure that Kubera would give some excuse to deny his request. 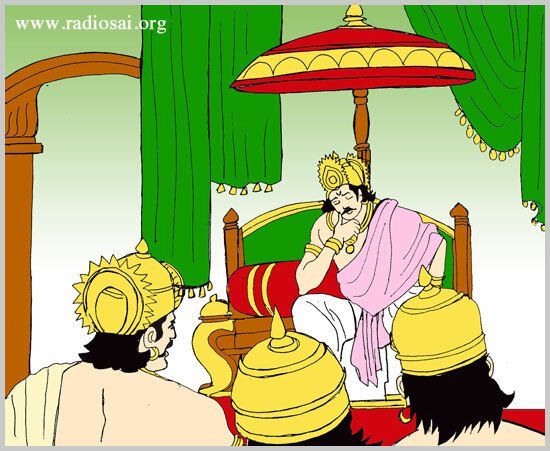 After a small conversation, Kubera asked Bhima the purpose of his visit to his granary. Bhima replied that their kingdom had been affected by drought and there was a terrible famine in the western region. He added that the citizens were starving to death and there was no surplus grain to feed them. He requested Kubera to spare some grain for them from his present stock. Bhima paused and looked expectantly at Kubera. Kubera neither gave excuses nor hesitated. He immediately called his assistants and ordered them to send emergency supplies to the area at once. He asked a caravan of 500 carts to be assembled and loaded with sacks of grain, and to set off to the land of Yudhishthira immediately. After some time, Kubera's chief assistant came and informed that the road leading from there to the plains was not suitable to be traversed. At one point of the road, it was so muddy that the loaded carts could slip down; the solution was to bring sand and cover that muddy patch and proceed. Kubera immediately gave orders to throw as much grain as necessary, on that part of the road which needs to be dried and let the carts proceed, as there was no time in hand. The assistant hurried out to carry out his order. Bhima could not believe what he just heard and stared at Kubera incredulously. Kubera asked him the cause for his astonishment. Bhima was a truthful man. He said that he had seen Kubera toil to recover a few grains that were lost in sand just before entering the granary. Bhima also confessed that he lost respect for Kubera then and thought him to be a greedy and miserly person. However when Kubera readily came forward to help Bhima, and also that he did not hesitate in the least in ordering his men to throw away few sacks of grains to make sure there is no delay in helping him, made him realise what an open handed person Kubera was. Kubera then told Bhima that each grain was precious and every valuable thing should be given its due importance, no matter how small it is. Every grain counts, because every single grain goes toward making a huge heap of grain. He further explained that valuable things are treasured for further utility. Grains are meant to feed the hungry and it is useless to send people food grain after they are dead of starvation. Thus, the grain that is sent will be no better than sand, for it did not serve its purpose. Kubera concluded by saying that when one is stocking up on something, he should be careful not to lose or waste any part of it. But, when one gives, he must be magnanimous. 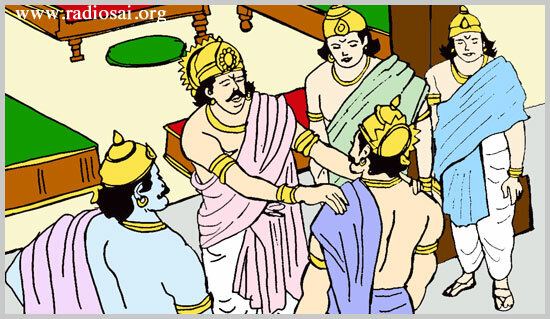 Bhima felt a strong respect for Kubera and bowed to him. He gratefully thanked Lord Kubera for his generosity and for opening his eyes to a new truth that he never knew before. Bhima changed vastly after returning from his mission. The lesson that Bhima learnt from Kubera ages ago is something that is still relevant in today's world. Friends, thrift is not to be confused with stinginess. The adage “A penny saved is a penny earned” is a powerful reminder for us to consciously strive to not waste money or any other resource—in fact, not even a tiny bit. During a discourse in Brindavan, Bhagawan once remarked, “There is nothing useless anywhere. We see a twig on the ground and think it is useless. No, no. Even that is useful, for instance, as a toothpick!” Our dear Swami has demonstrated the importance of being thrifty through various instances in His own life. Indeed, every act in His life is a powerful message for us. We might wonder how one paisa could make a difference. But, don't 100 such paise make up a rupee? It's the small drops that make an ocean. So, let us use our discretion and try to save every bit of every valuable resource. At the same time, let us not forget to be generous when we give to others—whether of our love, time, money, or any other help. This way, we are bound to experience inexplicable joy and peace within.